Home › Stories › Anushka – This is a game changer! Anushka – This is a game changer! Anushka, an honors student entering the 7th grade, loves books and horses. She is non-verbal and began using a high tech communication device about two years ago. In her school and community, she is the only one who communicates in this way. She and her family are used to being judged by people who don’t understand Anushka’s disability. 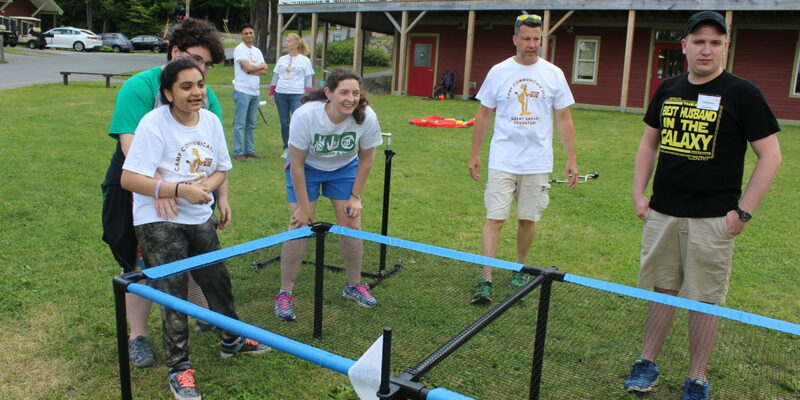 This summer, Anushka and her family spent five days at Camp Communicate, an innovative retreat at Pine Tree Camp designed specifically for non-verbal children who use computerized devices to communicate. Anushka’s father, Animesh, said they could see immediately how valuable this experience would be for their family. For the first time, they were surrounded by other families who understood their experience. They didn’t need to explain why their daughter communicates with a device or how it works. They knew they had found a network that they can turn to for support long after camp is over. Anushka uses an eye gaze device, meaning that the device uses her eye movement to select the word she wants to say. Her father, Animesh, says that people don’t understand how much effort it takes for Anushka to express herself this way. If she feels that the person isn’t going to give her a chance or is underestimating her abilities, she will shut down and not even try. Anushka felt nervous about coming to Camp Communicate where everything was unfamiliar. Right away, she began to feel more comfortable as she realized she wasn’t alone. Surrounded by other children who communicate with “talkers,” she participated in summer camp activities designed to encourage the development of her comfort and fluency in using her device. While Anushka was participating in camp activities, her parents had a chance to enjoy some respite. Normally, taking care of Anushka doesn’t leave much time to take care of themselves as individuals or as a couple. Her mother, Nita, participated in the parents’ “Paint Nite” activity. “When is the last time I ever painted?” she said with a good-natured laugh. “We took the kayaks out on the lake for a half hour. We have never done anything like that,” Animesh said. “Camp Communicate has given Anushka and us so many memories which we still cherish,” they said.